I've never had such trepidation in making a cookie as I have making cookies representing the nativity scene. Well, first off I wanted them to be wonderful and beautiful, just like the birth of Jesus Christ. Second, I was scared of them turning out ugly and odd looking. And also because they were huge. Apparently I didn't read the description on size when I ordered these. Honestly, the wisemen and camel is about 6 inches tall. At least. Originally I'd bought these cutters because a customer asked if I could do nativity cookies. But upon getting the cookie cutters in hand I knew that I'd have to charge her a ton to make them since they were so big, not to mention that I wasn't too sure on how to decorate them. But my mother convinced me to try. And to send them to one of her closest friends who is a Minister of a Presbyterian Church up in Milwaukee. Her name is Jean Dow - if you're in the Milwaukee area I strongly suggest visiting her church, Immanuel Presbyterian. She's wonderful - and she came back home to Lincoln to marry my husband and I four years ago. It's something I know I will cherish forever. As will my mom and my grandma. Yeah I tried out a new chocolate sugar cookie recipe. I'm not in love. It needs to be tweaked. But it's better than my old one. So progress is being made. 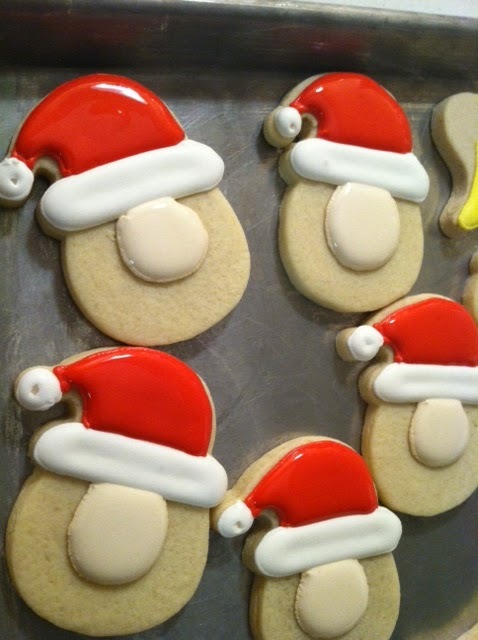 After baking the cookies I still wasn't sure about how to decorate them. I'd somewhat put it off. But I did think that I should make a base layer of white. Why? I don't know. I think it was my stalling tactic. Either way fresh white cookies look pretty. And it gave me an idea. Stained glass. Or something resembling stained glass. It not only looked simple and clean but also reminded me of all the stained glass windows in our church growing up. And how on Christmas Eve at the candle light service they seemed to always glow. So after outlining, I started flooding. And flooding. And praying. They still aren't perfect yet. I decided that I needed to outline each section. At first I thought in the same color as the flood, but then I thought...what about black? Like actual stained glass. Seeing as how I only made one cookie of each? Dang me for not making more. The nativity scene finally done! Overall, I'd give it a 8 out of 10. I like the stained glass idea, it just needs perfection. 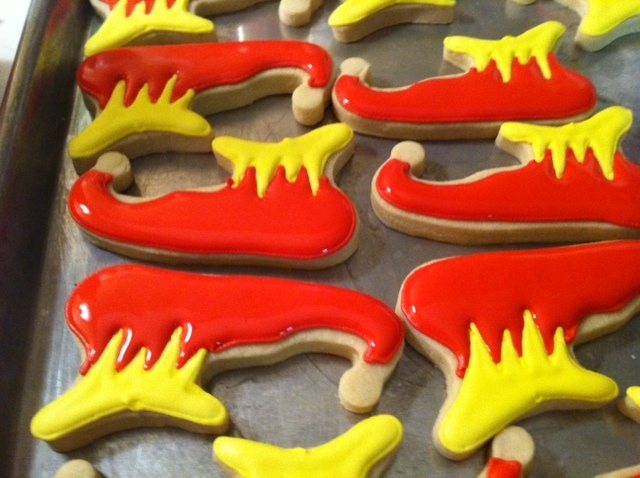 Overall, it's not necessarily about the cookies but what this time of year means. 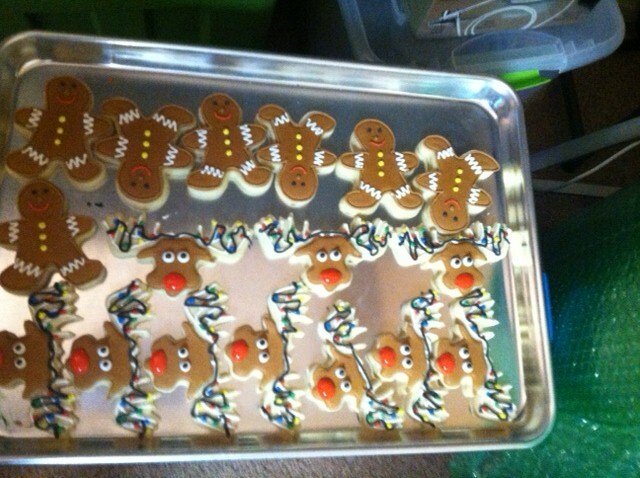 Mainly because I've completed the 2012 Chrismas season in making cookies! Best part is...I'm happy with the cookies. My mom asked if I'd make cookies for the lady who does her nails. She even bought me a nail polish bottle cookie cutter. I was happy to whip some up. Not only because she bought me the cutter, but when I lived in Lincoln Nancy did my nails too. Oh how I miss Nancy. But oh how I hope she enjoyed the cookies. They were pretty simple, mainly because I wasn't quite sure what to do with the decorations. 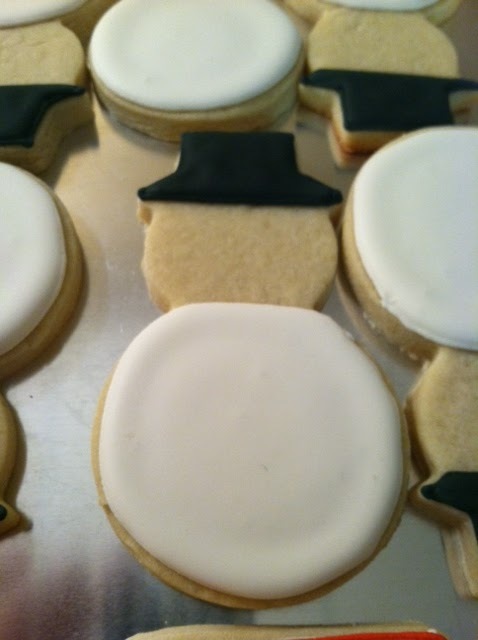 I've got more ideas now that I've made this cookie once. I'm thinking about adding a label, smaller writing, maybe some sparkle. Guess I'll just have to make them again. If you're wondering what the "Nb" stands for that's Nancy's initials. OPI is a brand of polish. Just in case you don't paint your nails. I wouldn't want you to be lost! It's always fun to be one. Even more fun when your parents are friends with the lady who makes cookies. Yeah - I'm that lady. 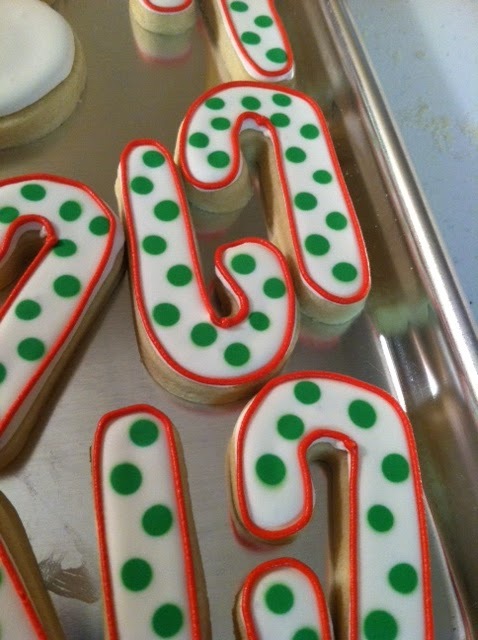 And I was happy to make cookies for a special someone's first birthday party last weekend! It was a wonderful party (yeah they invited us too!) and I think everyone enjoyed the cookies! Along with a few little monkeys! Happy 1st Birthday Mr. Callen! We hope year number two is just as much fun. And P is for progress. 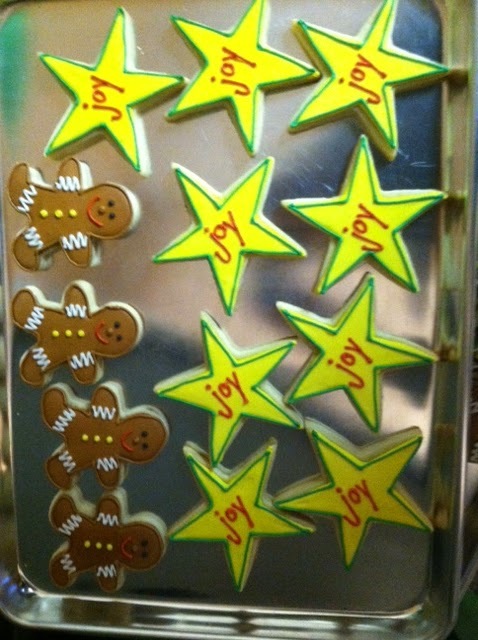 I'm making progress on the 14 dozen Christmas cookies I'm making this week in my final holiday orders push. They make me smile. Even if my hand is in a permanent claw from holding frosting bags. After I've unclenched my hand I think I'll finish these up tomorrow! What's with the new look?! If you're visiting you can see that we have a new look. And isn't it nifty? Prettier than a new penny. I wish having a shiny new penny was as exciting as it used to be when I was a kid. We got a lot of those in our stocking and I thought I was rich...when in reality I only had about $2.00 in change. Oh those were the days. Back to the shiny new pretty website. We're still working to add more things to it - like photos. But seeing as how it just got done yesterday there hasn't been too much time to add things to it. Heck, we are still making cookies over here! It is the holiday's after all. But I plan to add in more photos and other fun this weekend. What that "other fun" may be...I'm just not quite sure. But trust me, it'll be F.U.N. So for now enjoy. 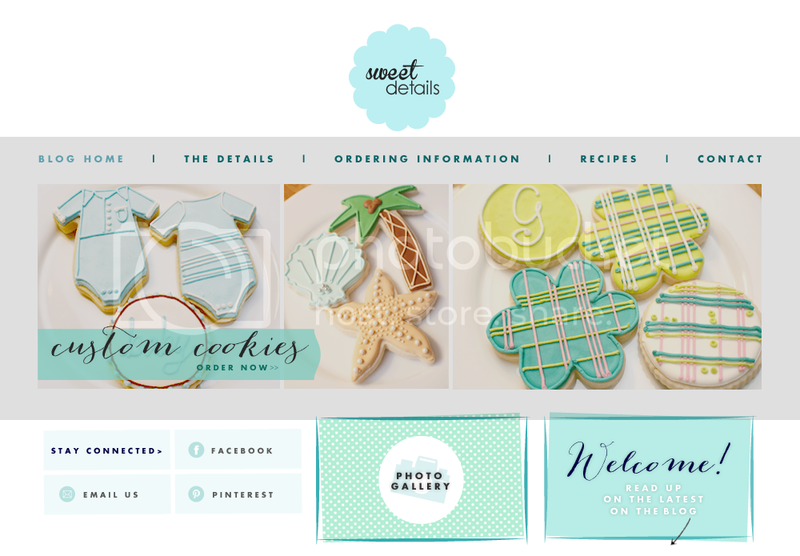 And special thanks to Smitten Blog Designs who made this fancy schmancy new design. I think they are pretty nifty. Nothing says fun like cookies at a vendor booth. Right? He didn't stay much longer past setup. Something about needing to go hunting. I brought around 250 cookies to the show - and only left with about 60. Of which I ended up selling to people who weren't able to make it! If they would have stayed at our house - I would have eaten them all. ALL. Nothing like cookies to put you in the Christmas spirit! Now if we could only get that snow. Who's Harrison? He's the son of a friend of ours. And he turned two. Plus his birthday was celebrated on Thanksgiving. Nothing else would do for birthday cookies. I'm pretty sure they were enjoyed! By both the birthday boy and all the party guests.